Durometers for Textiles and Yarn Package Hardness Testing. 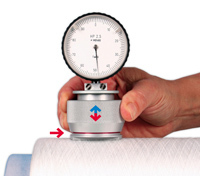 Constant-pressure indicating system assures uniform test pressure eliminating false readings due to differences between operators. These Durometers use Shore A spring force with 2.5, 5 and 10mm diameter spherical indentor specifically designed for yarns, fibers, monofilaments and similar textiles. Operation is as easy as pressing the spring-loaded knurled aluminum shell down to the red line.